Not all gifts for men need to be big and pricey, in fact some favorite gifts for men are those small gifts that make every day grooming more enjoyable. So, this is a chance to give them a gift they will really appreciate, a shaving cream that will make their shaving more of a blessing and less of curse. Here is a look at some of the best shaving creams for men that will provide you with a great inexpensive go to gift idea. For some reason, many men love the scent of sandalwood and this Taylor of Old Bond Street Shaving Cream hits the right masculine woodsy notes without being too overpowering. This shave cream is a nice woody blend of sandalwood and cedar with notes of lavender, rosemary, jasmine and rose for an outdoors fresh scent that reminds one of those old fashioned barber shops and will make men look forward to their morning shave. It comes with a bowl included and can be purchased singly or in a two package. The ingredients are high quality and the product whips into an amazing lather. This paraben free shave cream will last a long time and leave skin feeling fresh and supple, making for a really smooth shave. If the man this present will be for is the type of man who likes to use minimal grooming products, then this option is ideal because the fragrance is somewhat long lasting and this makes using aftershave unnecessary. 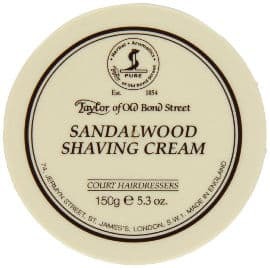 This Taylor of Old Bond Street Shave Cream is very popular among men, getting excellent reviews. Proraso is an Italian company which has been making men’s grooming and shaving products since 1926, having earned an excellent reputation for its products. Proraso Eucalyptus and Menthol Shave Cream is one reason why their reputation remains strong. This product comes in a toothpaste type tube so there is little waste. Just a pea size amount makes a great lather that is perfect for his morning or evening shave. It contains high quality skin softening ingredients such as eucalyptus oil, coconut oil and natural glycerin. Proraso shaving cream provides men with a nice cushioning lather and this small tube lasts a long time. Users not only feel that this product works and smells great, but that it also leaves their face feeling great. Some users do find that its aroma is a little stronger than they are used to or that they would like, so if he is a man with a sensitive sense of smell or who likes using an aftershave, then this shaving cream may not be for him. 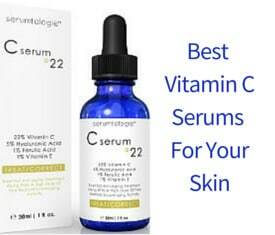 However, most people like this cream and love the cooling effect it has on their skin. The Art of Shaving company is dedicated to men who truly enjoy their shaving and see it as an art as much as a necessity. Their Art of Shaving Shaving Cream comes unscented and in a variety of fragrances, giving men the ability to choose the fragrance they like the most. Fragrances they can choose from include sandalwood, lavender, lemon and ocean. The unscented version is perfect for those men who have a sensitive sense of smell or want to use an aftershave and don’t want the cream’s scent competing with that of their aftershave. This product is known for its rich foaming lather and for actually helping to hydrate the skin, taking away that feeling of dryness and improving its condition. Only a small amount is needed for each shave and the cream lasts for several months making it very cost effective. The sandalwood is a nice masculine fragrance, the ocean kelp feels really refreshing, and the lemon scent really wakes you up. 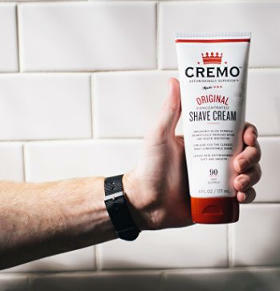 Cremo Original Shaving Cream comes in a 6 ounce container. It is foam and paraben free and goes on slick and smooth while helping to reduce nicks and cuts. Made in the USA, it contains such ingredients as Macadamia seed oil, Aloe, Calendula Extract and lemon Extract. This shave cream needs to be mixed with a fair amount of water to create a slick film that moisturizes your skin while softening your beard. It does slick up quickly and makes shaving easy and almost effortless. It has a nice scent and actually helps reduce razor burn and rashes. Your razor glides easily when using this product resulting in a close shave. After they shave, users feel that the remaining crème washes off easily. Many consumers also like that this is one of the few high quality shave creams that are made in the USA. 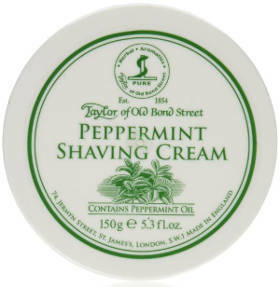 The Taylor of Old Bond Street Peppermint Shave Cream is a cool minty shaving cream that comes in a 5.3 ounce jar and is made in the U.K. It does not contain any parabens and can be used straight from the plastic tub. Most users find that it is strongly scented when you first apply it, which is sure to wake you up. Luckily, once you have completed shaving, the scent is much lighter. This product does work up a great lather that is rich and creamy. It allows for an incredibly close shave and leaves your face feeling refreshed and your skin feeling soft and moisturized. 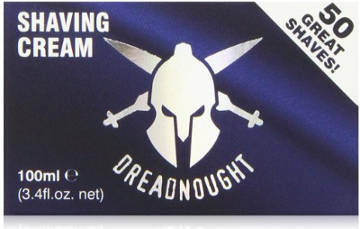 Dreadnought Luxury Shaving Cream comes in a 3.4 ounce container and is paraben free. This product is the American version of Bluebeards shave cream. It creates a rich and thick lather which has a fresh scent and softens whiskers well. In addition, it is long lasting and helps prevent whisker burn and irritation. 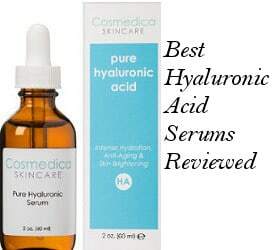 It contains such ingredients as Aloe Vera, Allantoin, Myristic Acid and Coconut Acid. Users review that shaving with this cream provides them with a relaxing morning routine that actually encourages some men to shave more often. They not only enjoy the experience of shaving, but really like the feel of their softer smoother skin once shaving is complete. As a high end shaving company, Taylor of Old Bond Street makes a number of different scented shaving creams, and this Lavender Shave cream is just one more scented option this company offers. It comes in a 5.3 ounce container and except for the scent it is pretty much like the other high quality shave creams this company makes. It goes on warm, creamy and smooth providing a nice thick lather that smells like real lavender rather than an artificial perfume version of lavender. Users say that it provides them with a close, smooth shave and that a little bit goes a long way. While this product is most often used by men, several women have also mentioned using it for their legs. 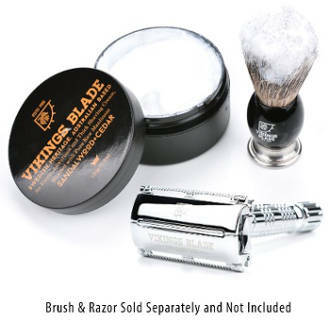 Keeping to the Company’s Swedish traditions, this Vikings Blade Luxury Shaving Cream is made from sandalwood and Western red cedar to give that masculine woodsy smell that most men seem to love. It comes in a 5.3 ounce container and provides lots of rich lather and good lubrication in a rich and thick foam. It is extremely easy to apply and clings to the skin. Users state that they experience less razor burn and irritation when using this product, feeling that it gives them a luxurious old school close shave experience. 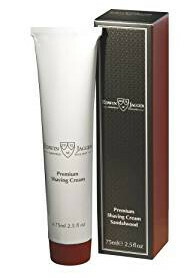 For those users who are looking for a high end, high quality and natural shaving cream, this Edwin Jagger 99.9% Natural Premium Shaving Cream comes in a 2.5 ounce container and is made of natural plant ingredients which many users love. It contains no parabens or mineral oils and has a pleasant woodsy smell, which you might expect from the plant based ingredients. It goes on smooth and slick and softens both the whiskers and your skin. When worked into a lather, it has a rich whipped texture than many users love. People also feel that this shave cream actually protects their skin from razor burn and irritation. 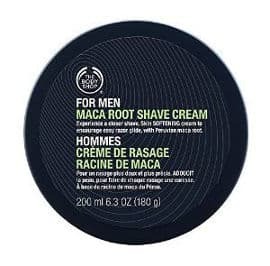 The Body Shop Maca Root Shave Cream offers men a refreshing change of scent from the standard sandalwood. This shaving product provides a rich whisker softening lather that softens the skin and protects it from nicks and cuts. An extremely small amount of it goes a long way with users stating that one jar lasts them for several months. Most men who have tried it out say that this cream results in a close and comfortable shave with the razor just gliding across the skin. It reduces razor burn and skin irritation, and leaves their skin feeling refreshed. They also experience a faster shave which find to be good for those with sensitive skin. After seeing how little is needed to produce a thick rich lather, they say it is quite cost effective and better than most shave creams that cost more. This Body Shop Shaving Cream seems suitable for men of all ages and for those who have been DE shaving for years as well as the newbies. 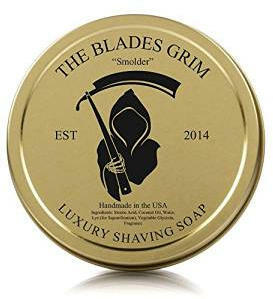 The ¨Blades Grim¨ Gold Luxury shaving soap, made in the USA, is a creamy shaving soap that comes in a 4 ounce container. It is handmade in America of all natural ingredients such as orange peel, Mandarin, Coriander leaves, Star Anise and Venezuela Tonka, giving this product a warm toasty masculine vanilla type of scent. This shave soap provides a good scented rich creamy lather easily, and users say that it allows them to get a close shave, leaving their skin soft and moisturized. A little of this product goes a long way making it an excellent value, and users feel that its scent is unique and interesting. 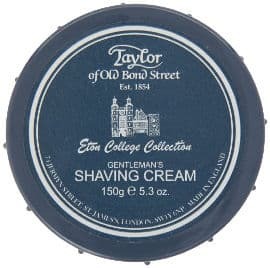 Another great shaving cream by Taylor of Old Bond Street is their Eton College Shaving Cream. This British shave cream has an invigorating fragrance with touches of citrus and patchouli. This aroma is bright and fresh but not at all overpowering. 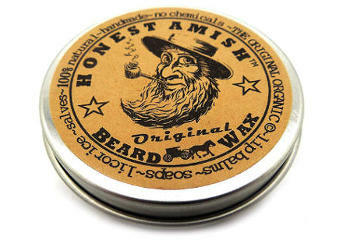 It smells masculine and you can purchase it in a single jar or a package of two 5.3 ounce jars. This product has a softer consistency than most other shave creams which helps it to lather up extremely quickly. It takes very little of this cream to create a nice thick and slick lather that makes your razor glide across the skin of your face while softening and raising those whiskers. It also helps reduce irritation and prevent razor burn resulting in a smoother shave and better feeling skin. One or two users did experience some breakouts when using this cream which might be due to their skin reacting to comedogenic ingredients, meaning ingredients that blog skin pores. However, the benefits most men have experienced make it a personal favorite of most users. In conclusion, any one of these great shaving creams for men would make a perfect gift without breaking the bank. Knowing which scent he likes more would also make your decision a lot easier.